Elliot finished his first stressful term of business school on Friday, March 25, and I returned from Copenhagen on the same day. On Saturday, we left Rotterdam for a short holiday to Portugal. After such a hard winter (with snow!) I was really looking forward to some high quality beach time...not to mention some fresh fish, sun, and a new culture! 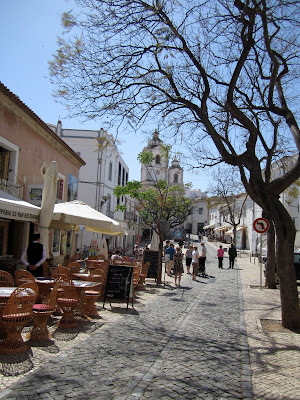 We got ridiculously cheap flights in and out of Faro, a small city in the Algarve region of southern Portugal. We stayed at a very basic, but clean and adequate (and included breakfast!) hotel called Algarve Sol. 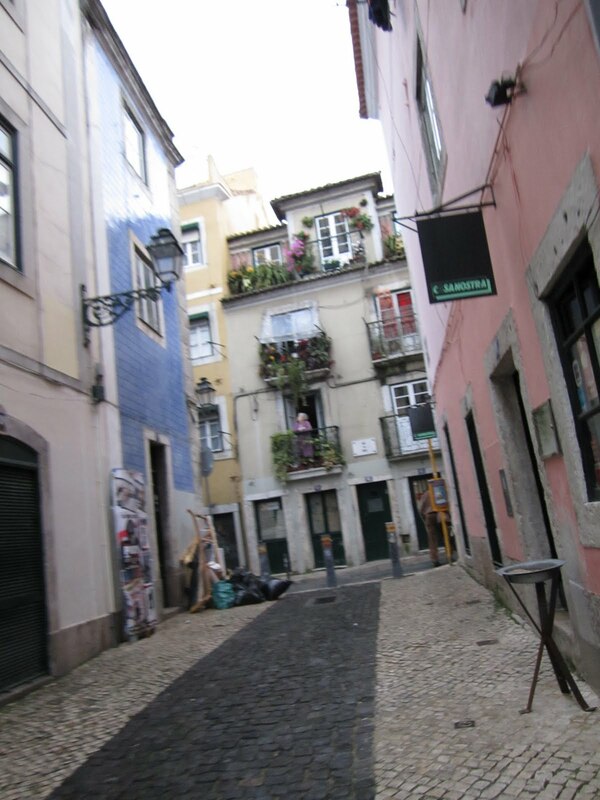 We arrived pretty late in the evening, but managed to get a good feel of the small historic city center and some tasty food at Dos Irmãos, a great restaurant with a lovely patio out back. We also managed to book a train for the following morning to Lisboa, as well as another night at the hotel for our return journey. After a quick breakfast we made our 9am train and in about 3 hours were in Lisbon. Smooth ride and only 20€! Great views of the sunny countryside and .50€ espresso in the dining car! Loving this country already. Since we only booked two nights in Lisbon we had about 36 hours left after checking in to our sweet hotel on the fringe of the city center. Looking back, I wish I had booked us a place in Barrio Alto, or another neighborhood closer to the center, but for 50€/night, including breakfast and a nice balcony, Hotel Turim was just fine. Plus we were only a 5 minutes walk to the metro--and with an all-you-can-metro card for two days at 4€, we were able to get everywhere we wanted to go. 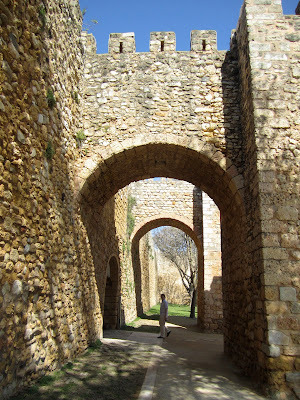 After checking in we dropped our bags and headed towards Castelo de São Jorge on the hill. Lisbon is a city of hills and reminded us a little of San Francisco in this regard. After living in the very flat parts of northern Europe for a several months now, it was so nice to walk up hills! We wound our way up and found a few secret staircases (just like the ones in Berkeley!) and finally reached the top. With our student discounts, it was only 3€ to enter the castle. What a majestic view of the ocean, the city, and Ponte 25 de Abril--the Golden Gate Bridge's little sister! 14th century walls of the city. was built in the 11th century. Castelo de São Jorge was the royal palace in the mid 13th century. designed by the same guy in 1966. After wandering back down the hill, at sea level we checked off several sights and neighborhoods. Praça do Comércio and Baixa downtown neighborhood. 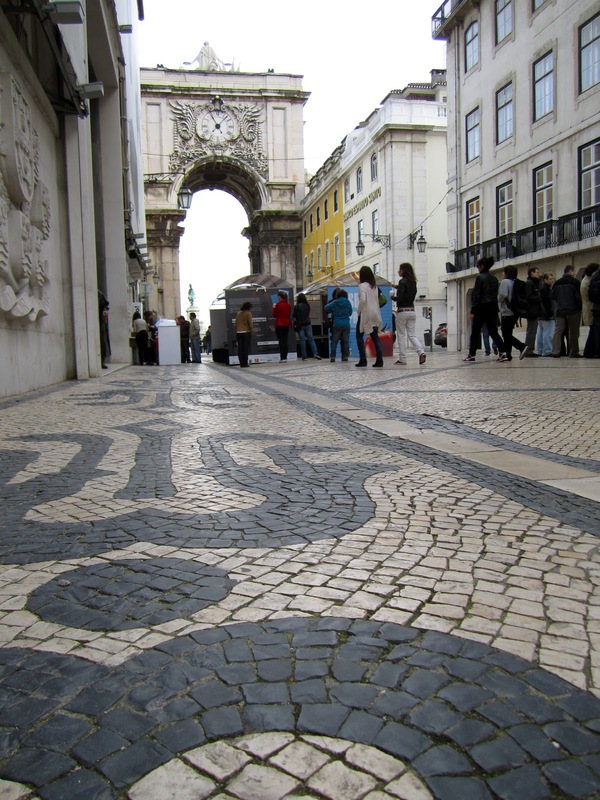 This area was devastated in the 1755 earthquake and tsunami, and was rebuilt using a 'grid' street pattern--the only grid in Lisbon. The huge plaza is located right on the river and acts as the gateway to the city, especially the commercial district. Chiado. Ritzy shopping district = great eye candy! Loads of boutiques and famous names. Miraduoro de São Pedro de Alcântara. Small parks with million-dollar views are strategically placed on the hilltops all over the city. Although we were already out of breath from getting there, the vista still took my breath away. Elevador da Glória. Just like San Francisco, people get around by trolleys. Some of the trolleys only take passengers up and down the steep slopes of Lisbon. Since it was part of our 'all-you-can-transit' transit pass, we took this one from the bottom of the hill to the top--a short 45-second ride, but worth it! 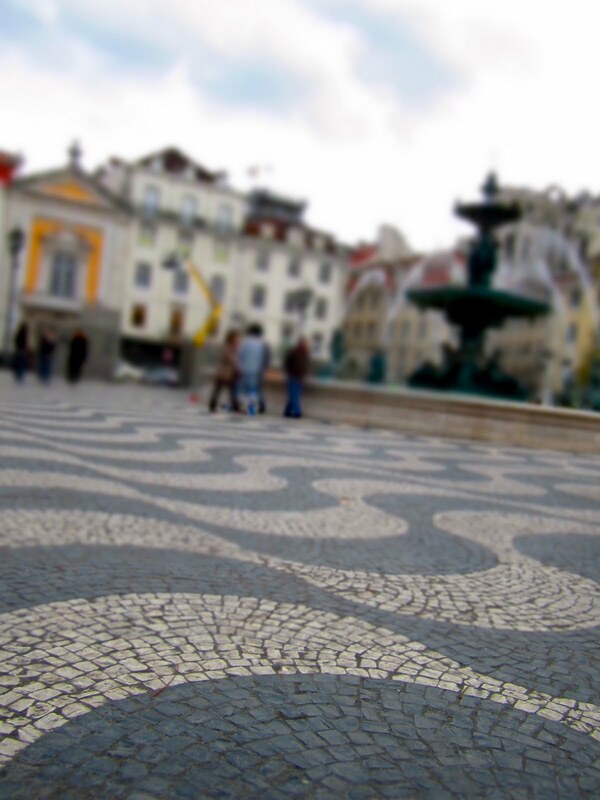 The gorgeous cobbled patterns that line every street in Lisbon. A quick evening siesta got us ready for an evening in the Barrio Alto. Since the time change that morning (yay! ), it was still light out until 7pm or so--finally it's spring! We walked around the Barrio Alto and to find a spot for dinner. What a neighborhood! So quaint and pleasant. Gorgeous cobbled streets, laundry hanging from balconies above, cozy tapas bars, cafes and restaurants, casual boutiques in the ground level. Adorable and so picturesque! We found a small tapas restaurant (maybe 4 tables?) and had a small bite and a glass of local wine. 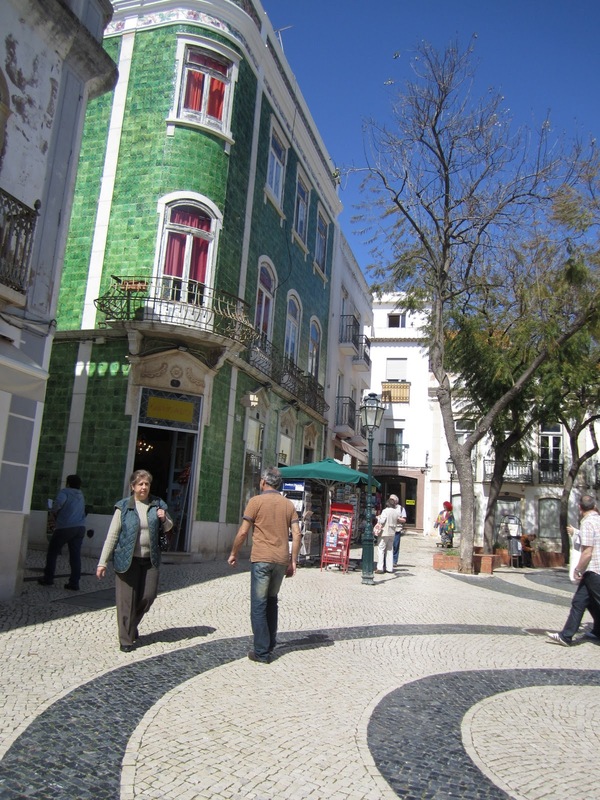 in Belém, a 15-minute tram ride from the center. Unfortunately, Prince Charles was visiting so it was closed to the public so we couldn't see Vasco de Gama's tomb. This late-Gothic 'Manueline' monastery was built in 1500 during Portugal's Age of Discovery when the country was wealthy from the spice trades. A pretty phenomenal structure. We then walked out to the old Torre de Belém on the water. This tower was built at the same time as the Monastery, also in the Manueline gothic style and was a fortress until the 17th century. We couldn't go inside this one either. After another tram ride back to town, we walked around Rossio Square. A beautiful place to meet people, watch people, and just lounge at one of the nearby cafés. The Alfama neighborhood was next on our tour. I couldn't get enough of the winding alleys and streets that open up to pint-sized pocket parks shaded with palms. Although I definitely got us lost, mixed up in the Alfama maze, we found a quaint restaurant for some fresh fish, rice, and local wine. We also found another Miradouro despite the evening's foggy drizzle. 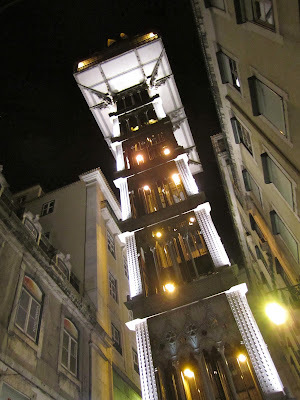 After dinner we found our way back to the Baixa neighborhood and stumbled upon the wrought-iron Santa Justa Elevador. This lift is much different than the others in the city, as it only takes passengers up to a lookout point instead of another destination. It was designed by an apprentice to Monsieur Eiffel and finished in 1902. And with that, we jumped back on the metro to get a good night's rest before our trip back down to the Algarve. The next morning we skipped town and headed for the beach town of Lagos, back in the southern Algarve region of the country. We quickly settled into our fantastic apartment studio (and patio!) at Villas D. Dinis, just outside the historic center of town. Lagos is a historically significant city: many exploration expeditions started from its port in the 1400s and it was also the birth place of the slave trade for medieval Europe. Elliot walking into the entrance of the walled city. Now the city is heavily populated with tourists from April to September, not really for its historical importance--more for its absolutely stunning beaches. We were glad to be staying outside the center, and more towards these stunning beaches. Quality beach time: CHECK! From here on, the days are a blur. We went to a different beach each of the three days, and just totally relaxed. I never truly realized how much I love the sun until I felt those rays warm my body. Oh, how I've missed you, dear Sun! The last day, we waked a bit further from the hotel and found ourselves wandering down the steps of Ponta de Piadade. These well-maintained stairs wind down the steep rock cliffs and dead-end at a small pier, where Portuguese fishermen are waiting in small boats to take you around the rock caves. We contemplated the 15€ tour, and finally caved in. So glad we did! Despite the language barrier between us, we did know "mira, mira!" and just followed his pointer finger to the various cave formations that looked like elefantes, macacos (apes), and tigres. After our tour, we hiked up the stairs and tried to find one of the deserted beaches we saw from the boat. We finally found a trail that lead to a very steep (and not so safe-looking) staircase made of rocks and sand. We couldn't see exactly what it would lead us to, but what the heck! Yes, our own little paradise...that we shared with a older, naked gentleman (who came here on holiday 15 years ago, then bought a camper and now lives here 6 months out of the year). Nevertheless, this was a beach that we only dreamt of and never really thought existed--and we were here! Just stunning. That night (our last night in Lagos) we ate at a cute local restaurant, right near Praia Camilo, on the edge of the cliff overlooking the entire bay. Delicious fresh fish and excellent fig tart. The next day, we had about 3 hours to kill before our bus ride to Faro, where we had to stay one night because our flight left at 7am. We decided to go back to Camilo for one last dip in the cool, refreshing water and just a bit more sun. Good bye Villas Dinis! We'll be back! We only had about 6 hours of sunlight left by the time we checked into the Algarve Sol (round two), but that was just enough time to see the major sites in Faro. Faro is definitely understated in the tourist world of the Algarve. It is an adorable city, with a historic, walled center, a superb pedestrian shopping district, and a cozy Barrio Alto feel. Overall, loved this country! History with an interesting past, stunning beaches, delicious food, juicy wine, great streets, and friendly people--what more could you ask for?! A happy tourist who got her California tan back!! Up next: Is it really spring in Holland?! 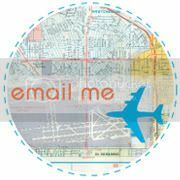 Take Care and keep on traveling !